Using Indian cotton paper I made these flowers. I wanted a different texture to experiment with. The flowers came out quite nicely. I used stamens on wire. Tip. Use hot glue to glue paper and wire. This card was made with a masculine theme. Diecuts and toppers from various sources. 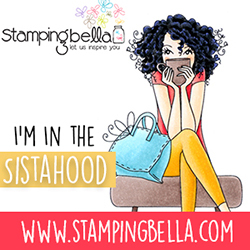 A new diecut and stamp from Stamping Bella. It is so cute. I really enjoyed coloring the picture and creating this little birthday card. i have made so many cards, and given them away, and so I have decided to make a journal with the gallery of my Art Deco cards. So I will be posting these over the next so many months until I move on to something else. This little card came out rather unexpectedly and I am so pleased with the outcome that I am going to keep this card for future copying. I was practicing coloring using a Penny Black stamp and then die cut it with a random shaped die. The rose is a Stamps by Judith design. These cards were made with Stampin Up cardstock. The stamps and dies of the hanging basket are from Heartfelt Creations. Simple and sweet. This commissioned card was made for a special mom turning 80. Happy Birthday. Made with Tattered Lace dies, flowers from Heartfelt Creations stamps and dies. Spellbinders lace border dies added. I made a box for its delivery. Here are some more ideas for cards. Of course there is an Art Deco one as I absolutely love the theme. Enjoy. This card was made with a Spellbinders die. I stamped the grape and leaf for effect and colored with water color pencils. The simple white is very effective if the die is intricate. The cards I make for the volunteer program can’t really have embellishments that will cause postal blips so unfortunately I can’t add the Heartfelt Creation 3 d flowers that I love to add. Here are some more of the cards.